Deià is a small municipality on Mallorca, situated on the northwest slope of the Tramuntana Range between Valldemossa, Sóller and Bunyola. 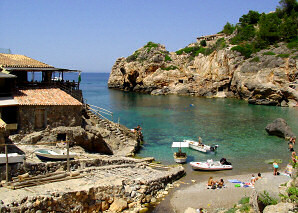 The area has five kilometres of coastline, including Sa Foradada and Punta de Deià, the Cala de Deià and the small Cala de Llucalcari. The highest point in the municipality is the Puig del Teix (1.062 m), with a spectacular view of the Serra de Tramuntana, in an area known as Serra del Teix. The old village of Deià, situated 200 metres above the sea in the southern slope of Es Puig to protect it from the North wind, and the small hamlet Llucalcari, situated near the coast some three kilometres from Deià towards Sóller, are the two centres of the municipality. Here there are also important properties, such as Son Marroig, one of the properties bought by Archduke Ludwig Salvatore of Austria (1847-1915), the first was Miramar in Valldemossa, after falling in love with the scenery of the North Coast of Mallorca. Because of its peace and extraordinary beautiful scenery, since the XIX century, many artists, musicians and writers have chosen Deià as their residence. Amongst others, are the English author, Robert Graves (1895-1985) and the artist and archaeologist from USA, William Waldren (1924-2003), founder of the Archaeological Museum of Deià. Traditionally dedicated to agriculture and fishing, Deià has become a tourist municipality without losing its singular charm and has a small, but select, accommodation choice, comprised of the hotels La Residencia, Es Molí and Costa d'Or, the latter in Llucalcari, the hostals Miramar and Villaverde, the interior hotel des Puig, and the agrotourism Sa Pedrissa. Deià also has a varied selection of bars and restaurants, mostly in the middle of the town on either side of the road between Valldemossa and Sóller. In the summer, the terrace of the Café Sa Fonda frequently has musical performances. In this popular café many internationally famous stars have given impromptu performances, accompanied by Kevin Ayers, an English musician who lives for long periods in Deià, and by Joan Bibiloni, a Mallorcan musician who also lives in the town. In the Cala de Deià, and only in summer, there are two restaurants: Can Lluc, right on the beach, and Can March, above the rocks, where fresh fish caught by the fishermen of the cove, can be eaten every day. Finally, in the outskirts of the town, towards Valldemossa, and on a ridge next to Son Marroig, is the restaurant Mirador de na Foradada with spectacular view over the headland of Sa Foradada. Deià offers many attractions, such as excursions on foot that can be carried out in the municipality, through the traditional terraces of olivegroves or the narrow cobblestone streets of the old centre of the town. The most popular and recommendable for all public are those that lead from Deia to the Cala (cove), the one that joins the Cala to Llucalcari, the one that connects Deià with Sóller and the Camí des Racó, that starts at Es Llavador in the village and goes up via old stone steps following the course of one of the abundant streams of the area. As far as culture, as well as some art galleries, there is the Parish Museum, the Archaeological Museum, Ca n'Alluny - Robert Grave's House-Museum and the Museu Arxiduc Lluís Salvador de Son Marroig, that every year has held the Festival Internacional de Deià since 1978, dedicated to chamber music. It is also worth stressing the Tertúlia@Deià, annual celebration of the Hay Festival dedicated to literature, music and art which is held since 2004. Other compulsory visits are the church and the cemetery in the upper part of the village. The patron saint festivities are held on June 24, for Saint Joan Baptista. Finally, we mention the Neighbours' Association, constituted in 2000, that edits the magazine, s'Encruia, published in Catalan, Spanish and English. Deià has become over the past few years, an open multicultural society, where the majority of the inhabitants coincide in the need to preserve the privileged natural surrounds they have. In this sense, we mention the book "Mallorquins, estrangers i forasters" by Jacqueline Waldren, an anthropologist from USA and widow of William Waldren, founder of the Museo Arqueológico de Deià. More information about Deià can be found on the web of the Town Council, on the weekly Veu de Sóller, and on the electronic publication Deia.info.